I don’t know about you, but the minute the calendar flips from September to October, I’m all about Halloween. Give me all the creepy, spooky things! I love rewatching old favourite TV shows and movies, as well as discovering new ones. With its shorter, cooler days and darkness falling so early in the evening, autumn seems like the perfect time to curl up and find a new favourite show or rewatch an old favourite. 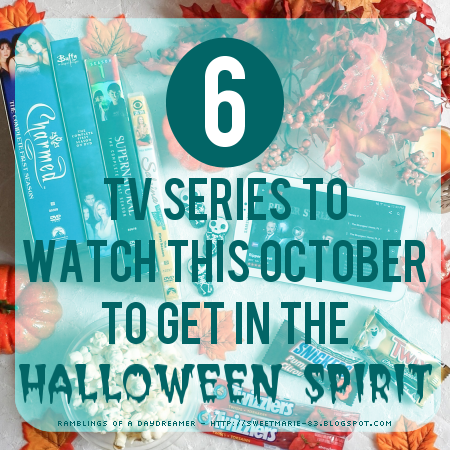 If you’re like me and you’re looking for things to get you in the Halloween spirit, here are 6 TV shows that are perfect for October. Buffy is a classic for a reason. With a literal kickass heroine, a great cast of side characters, hilarious dialogue, and real emotion, this show has it all. It has a variety of monsters to satisfy those looking for a creep factor, and it also has a lot of real-life lessons about love, family, friendship, and life. 2017 is the 20-year anniversary of the show’s debut, which makes me feel ancient (I was 13 when it started, and I can still remember being obsessed and talking about it with my friends), and also makes it the perfect time to start watching it if you’ve never seen it, or to do what I’m currently doing: a series rewatch. This is another show that blends scary monster real-life issues. The first couple of seasons have some downright terrifying, gruesome episodes that deal largely with urban legends. As the show continues, the Winchester brothers deal with various creatures that go bump in the night, but there are also running problems that last for several episodes or even a whole season. Supernatural is also the perfect show if you like complex sibling relationships. There’s a lot of pain and heartache in this show, but that’s part of what makes it so irresistible - it's impossible not to feel for the brothers and their issues. “The power of three will set you free, the power of three will set you free.” I’ll admit I never finished watching this series because I stopped getting the channel it was on (UGH), but I loved what I saw of Charmed, and I adored the Halliwell sisters. I have a soft spot for sibling relationships, plus I loved the girls’ magical abilities and watching them struggle with their powers as well as all the supernatural circumstances thrown their way. Another 90s classic. This one is completely different from the other shows I’ve mentioned in that it’s geared toward a younger audience and is much cuter and fluffier. That’s not to say Sabrina didn’t deal with her share of real-life issues. I just rewatched this show year before last, and I had a whole new appreciation for it as an adult. It’s funny and sometimes silly, which makes it perfect if you’re looking for a lighter, family-friendly show that’s perfect for Halloween. Unlike the other shows listed above, Ripper Street deals with monsters of the real-life variety: murderers, thieves, and a whole host of other criminals. The show is set in seedy, post-Jack the Ripper Whitechapel, London, which is what drew me to it initially. Like many other people, I’ve had a sick obsession with Jack the Ripper for years, and I find that time period in London (late 1800s) truly fascinating. It was like a whole different world, and many of the things that happened back then were horrifying, gruesome, and downright depressing. I also love seeing the advancements in science and medicine during that time; one of the main characters is a medical examiner, and he’s always experimenting and making interesting discoveries. Like with Ripper Street, Pretty Little Liars is all about the real-life monsters. So many things about this show are wonderfully creepy, right down to the theme song. PLL is full of twists and turns, secrets and lies, and there are some episodes that will just about scare the pants right off you. Two years ago before I had Netflix, I was apartment- and cat-sitting for a friend and I stayed up until 2 or 3 every night binge-watching as much of the show as I could. It’s seriously addictive, and now that the series has come to an end, it’s the perfect time to watch it. So much happens in the show, it’s a good one to binge-watch so you don’t forget things. What are you watching this fall? Have you watched any of these? 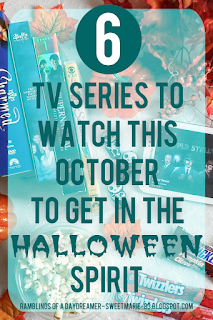 Have any recommendations for shows you think are perfect for getting in the Halloween mood? My husband got into Supernatural when I was catching up on the last few seasons so now he's starting the series from the beginning and I've been rewatching a lot of them with him. Great series did October. Yay! I watched up to about season 6 and then got sidetracked for a couple years. I couldn't remember where I left off or what was happening, so I decided to start from the beginning and watch the whole thing. I'm on season 10 right now. I have watched all these series at some point in my life, with Buffy being one of my all-time favorites. I lost track of Supernatural when my DVR got fried, but I hope to start up again soon.